MOTIVE: Lily wants to kill Daisy to get her crown of Sarasaland. Then there is a game which STARS DAISY and Lily is the evil person trying to kill her. The game is called "Princess Power". Daisy then enrolls in Peach and Rosalina's help to defeat Lily once and for all. Does anyone have their own character they would like to share? I know mine is cheesy, but hey, who cares? RELATION: 's evil twin, & 's yoshi. LOGO: A yellow yoshi egg with triangles instead of circles. 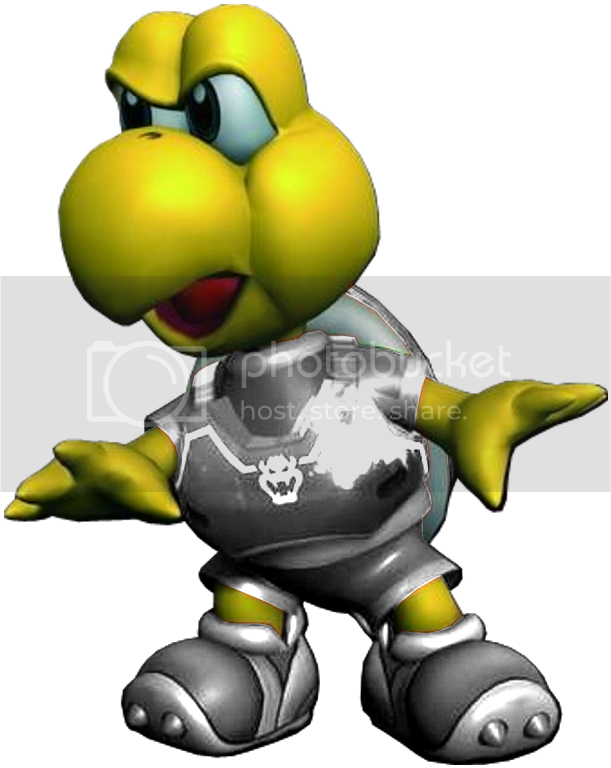 MOTIVE: Warshi is Wario and Waluigi's yoshi, he is never ridden exept when Wario was a baby, he is Yoshi's archenemy and twin and want's Yoshi destroyed because Yoshi was his parents favorite child. DESCRIPTION: Looks like Petey except lighter, wearing a bikini, and she only has 3 pedals arranged to look like hair. MOTIVE: Pam's motive is the same as Petey's. MOD EDIT: No real need to double post. Description: A funky fresh new plumber on the block with an attitude. Ronaldo is working for his dad Jimmy P. to capture the princess and take her back to the Coney Island Disco Palace. Ronald also wears pink, but totally isn't gay. Description: Wario's answer to Luigi. Looks kinda similar to his unnamed sidekick seen in Mario Tennis. DESCRIPTION: look's a lot like mario but without a mustache and a mario hat. He has a black beanie with a big red E on it. He has a black shirt and red overalls. Red eyes but has no side(he isnt evil). His shoes are black with sideways red E'S on them. HE also has longer black hair. MOTIVE: A protagonist of Bowser and the Mario Brothers, hes the only one who knows about his relation to mario and perfers to keep it a secret. getting revenge on his archenemy Ludwig Von Koopa for destroying the planet he called home, other known as nintendland. First featured games are Super Ezario I II II & IV. Side games are the timecap series which is Ezario timecap I Ezario timecap II:Power pace and Ezario Timecap III: hat of the present. history:at one pint was going to join the koopa army as a leader but later found out what ludwig von koopa has done to his home planet of nintendland. Description: Shoots brown -seeking fireballs from his tan colored wand. He sometimes shoots bob-ombs. He also jumps in the air so high that you can't see him. He comes back with a shockwave that can stun you. Jump on his head 3 times to defeat him. Location: He would be in the World 9-Castle of New Super Mario Bros Wii. To get it you would have to clear World 9-8 without getting hit by even one little enemy. Or in other words a no damage run. Logo: A Koopaling that looks like Ludwig Von Koopa and sounds the same. But he's got a black hairdo instead of a blue. Weakness: and jumps on the head. Description: he's the black version of a little taller than he has a Burnt orange Benie cap with a Silver C on it, Burnt Orange shirt, Teal overalls and Brown wizard shoes his nose isn't pink it's brown like his skin and his mustache is gray. Description: Tall, carmel skintone with tiedback dreadlocks, wears a brown fedora hat with a beige rim, a beige buttonup shirt with a brown tie, a brown jacket with beige slacks, and brown and beige shoes. Strength: able to woo and win over any female, allies and enemies. attacks: Boomerang fedora hat, grabbing and *bleep*slapping any enemy in his way, punting goombas, having his newly aquired female allies attacking the enemies. Kart colors: Beige with a brown accent. Motives: Shut Bowser down, Plug Wario up, and blasting Waluigi to the moon. SIDE: bad, in all ways, is addicted to causing misfortune at all times and blaming yoshi, her cousin for it! DESCRIPTION: She is dark purple with a sparkly lilac bow in her hair, she has lilac boots and a indigo tounge. She has always been jelous of yoshi because he was the one getting noticed, and so she turned to the dark side with the help of , and always tries to stop yoshi from doing good and always pops up to block them when , and are on missions! MOTIVE: To cause misfortune to yoshi and play in the game 'The revenge' where Yoshi, toad and mario must try and stop Loushi from stealing Yoshi's magic eggs! My signature ran away. You can try to catch it if you want! SIDE: originally a member of koopa bros., now works solo. RELATION: The son of kent c. koopa and a hammer bro in world 5-8, older brother of Jr. troopa. MOTIVE: to hunt down the seven star spirits, kill peach, and marry misstar. what did the scouter say about nibbles the koopa's awesomeness level? Description: Bulb-omb's talks in bombs. Looks just like a Bulb-ulb just smaller. They are very kind to living beings. Relationships: Many Yoshis adore their sweetness and become stronger to withstand the impact they cause. It all started up when Cackletta stole the voice of a helpless Bulb-ulb and Yoshi replacing it with bombs. They had 4 babies helping them raise awareness of Cackletta's plan to steal Peach's voice. They continue to grow in numbers and fall in love with others. They have species called: Bob-omb-Bob-ombs(only diferences are that they speak in bombs) Gom-ombs Koop-ombs Mari-omb ( created by a fan of ) Para-omb (any flying creature ) and Luigi-omb(same story as Mari-omb) and YOSHI-omb created by the original babies!!!!!!!!! Whew... that all lot of species!! Motive: Helps lead with Bowser. Attacks: Can send a squad of Buzzy Beetles to kill Mario really fast. He, can breathe Water, and Tornadoes. He can also go in his shell and hit Mario. Description: He has the Mario family resemblance; he basically looks like Mario but has a French-type handlebar moustache. He talks in a very French accent, saying "Oui" and "Non" and all those. Logo: A red mushroom with a handlebar moustache. Motive: He's a plumber. What do you think? Logo: Lario's is a green Mega Mushroom, Maruigi's is a skinny red mushroom, Walio's is a purple mushroom, and Weegee's is a long, thin, green mushroom. Logo:Sitting On A Gold Thrown With A King Mushroom Turned A Bit Crossing Arms And Winks. Cart: A Silver Motor Cycle With A Gold Stripe Down. She Has A Redish/Pink Dress Brown Hair Like 's But One Piece of her hair Covers Her Sky Blue Eyes. She Rules The Sky Kingdom Her Casle Is Silver With One Window Where 's Painting Would Be. She Has Been Kidnapped By Bowser At Lest 4 Times. She Has Pearl Earrings Like 's But There Gold With A Silver Cloud. , , , And, All Fell For Her. She Is Madly In Love With Luigi! She Has Long Silver Gloves With A Star On It She Also has A Silver Wand. The Only Person Who Dislikes Her Is Because DUH She Stole Her Boyfriend! Baby Rose: In Cart She is The Fastest Racer There But it Is Verry hard To Get Her! Her Cart Is A Stroller (Like All The Babies) In Beautiful Stirling Silver. Mario Has Always Wanted To Kiss Her, When She Got Captured Bowser the first Time, She Fell With Her Red Umbrell With Pink Laces. She Says, "Wha- Where Luigi!?! I WAS Expecting Him." *Mario Laughs* "Well For Coming I'll....... Give You a Kiss. When She Kisses Mario On The Cheak He Moves His head And Kisses Him On The Lips. Her face Turns Red, Mario Stars Running. She takes Out Her Wand And Says, "OHH NO YOU DON'T!" She Says Also "You Going To PAY!!!" Mario Pays By Massaging Her In A Hot Tub And Being Her Servant For 2 Months. Don't Mess With Her!! !